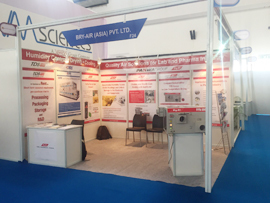 Bry-Air Participated in the 6th edition of India Lab Expo 2015 schedule from 8~10 Oct at Hitex Exhibition Centre, Hyderabad, India. The 6th India Lab expo, India’s largest exhibition on laboratory, scientific, analytical and biotechnology sector attracts international as well as Indian manufacturers and distributors. We displayed our compact model of Dehumidifier to highlight its applications in Lab & Lab equipment. Decision makers from sectors like hospitals, diagnostic labs, oil & petroleum, chemical, cosmetics and Government departments interacted with our Airgineers during the event to understand the necessity of humidity control.